News just in this morning from Torsten Sieckmann, CEO at Sunseeker Germany that Jan Schwarze has now sold his central listing, a 26.6m Sunseeker 94 motor yacht with Cornelius Kistler At International Yachting AG in Switzerland acting for the buyer. Fitted with two MTU 2000 16V engines, the Sunseeker 94 is a modern yacht, providing a quiet retreat of pure and exquisite comfort. Built in 2005, its ample aft deck is perfect for receiving guests and casual alfresco dining, while the sundeck affords the ultimate sanctuary for relaxation and comfort. A large master stateroom, two twin cabins and one large VIP cabin provide a wealth of space for the yacht's guests, each with en-suite and state-of-the-art entertainment and communication systems. 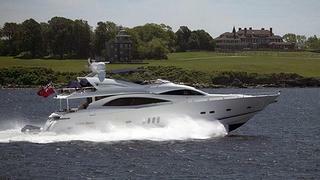 The asking price for the Sunseeker 94 was €2.2 million and she will stay in the South of France.